High Having complete control of the club I love. Low Trying to wake up Monday morning because I was up ‘til 3am trying to finalize that transfer. At what point is enough, enough? Football Manager (or Championship Manager before that), is over a quarter of a century old and, barring the odd iteration, has been a game of evolution more than revolution. When do minor incremental changes become so meager that it’s no longer worth investing in the next iteration? After all, the game features an editor and there are no shortage of database updates to keep a team’s lineup fresh and up to date. 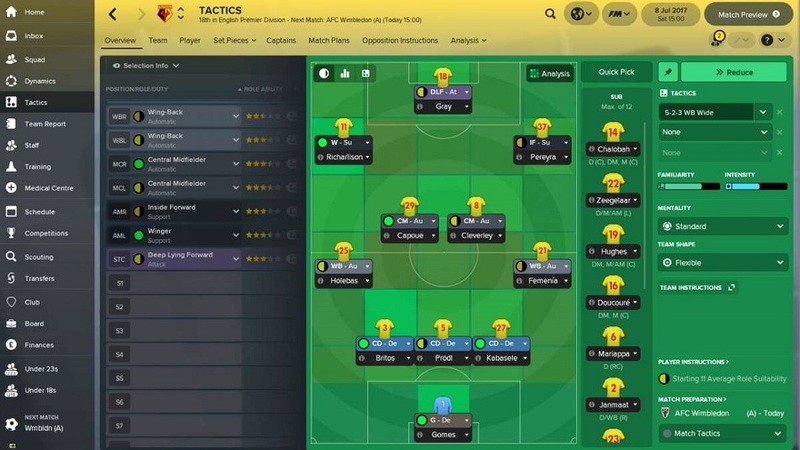 So why buy Football Manager 2018? To answer this question, it’s important to take note of the changes from last year’s iteration that received a glowing review by myself, of course. Perhaps the most requested upgrade is the 3D engine. Creative Assembly, the studio behind the renowned Total War franchise as well as the eerily atmospheric Alien Isolation, have helped overhaul FM‘s aging engine, which now features new motion capture and improved AI. Last year saw the addition of Sports Scientists, now commonplace in the real world of football management, but they ultimately had little impact on the feeling of the game or information players would receive. Now, feedback is important and can give much improved insight over player performances post-game, which is bound to please the micromanagers out there. The biggest diversion, however, is in the new ‘Dynamics’ module. The purpose of Dynamics is to bring more correlation between management of the dressing room with player performances on the pitch. Fans of football know all too well the effect on a team when the manager has failed to provide proper guidance. Harmony is the aim here, and the less fractured the dressing room, the better a team will play on the field. Each team has ‘team leaders’, ‘highly influential players’, ‘influential players’ and the others who make up the squad. Dynamics feels like one of the most important changes to the franchise in years. Building upon the simple ‘morale’ basics of past iterations, the player is now kept in the loop of the ups and downs in the team, and it’s up to them to handle situations correctly, or else it’s possible to ‘lose the dressing room’ and see the team spiral into chaos. Dynamics adds a true sense of of cause and effect, and one small mistake such as praising the wrong player or utilizing a formation that doesn’t please key members of the squad can cause a ripple which, ultimately, can have devastating results. 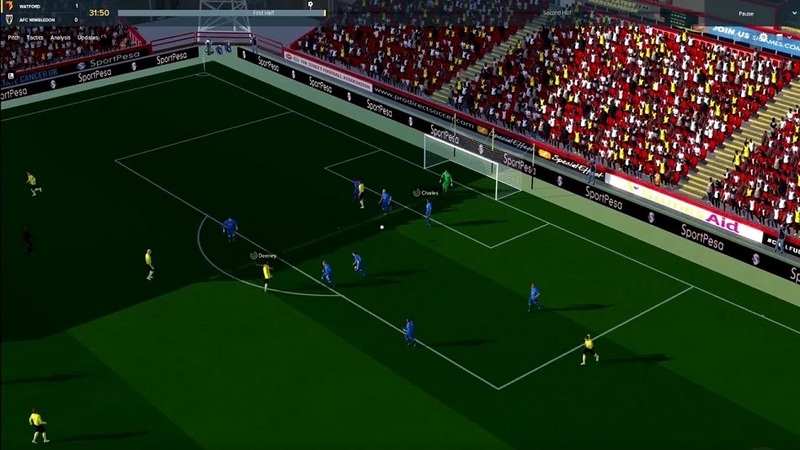 Tactics screens now give more information regarding areas of dominance on the pitch, and the resulting weakness of opting for a specific player or formation. Purists of the series may not like this hand-holding implementation, but newcomers or those daunted by past revisions will surely find this easily-to-comprehend information hugely beneficial. The scouting network has been often criticized for being both too complicated and not defined enough. Scouts now regularly turn to the player with picks they were impressed by on their travels, allowing for a more widespread search through the endless hive of transfer activities. This is now more rewarding than ever, whether it be a case of finding the next wunderkind or signing the perfect previously-established star to fit in with the team. This, combined with the previously mentioned dynamics system means picking the right player has become more important than ever. Fundamentally, there aren’t that many changes to the core formula, and as with the 2017 iteration, it was no revolution. So, to answer the original question at the beginning of this review, at what point is enough, enough? With the abundance of database updates, face packs, team crests and more mods so easily available (and just as easily implemented) is it worth spending money on yet another version? Disclosures: This game is developed by SI Games and published by SEGA. It is currently available on PC and Mac.This copy of the game was obtained via publisher and reviewed on PC. Approximately 40 hours of play were devoted to the single-player mode. There are no multiplayer modes. Parents: No information for this game was available from the ESRB, but last year’s version was rated E. The description reads: This is a sports simulation game in which players select and manage real soccer teams from clubs and leagues around the world. Players make managerial decisions that include negotiating contracts, handling staff, and developing the team’s tactics and strategies. Deaf & Hard of Hearing Gamers: The game has zero restrictions as all information is written with no audio cues. It is fully accessible. Remappable Controls: The game is fully controlled with mouse controls and utilizes the keyboard for optional shortcut navigation and data entry. Colorblind Modes: For colorblind gamers, there is a fully re-skinnable interface with many alternative skins available online. Default options features a “light” and “dark” theme option.